Wooden antiques are not always hidden away in upscale shops and grandparents’ homes. Sometimes they hide in plain sight, littering rural roads across Canada and the U.S., those once-functional buildings that helped settlers put down stakes across the continent. For antique restorer Blayne Wyton, the dilapidated barns he saw driving with his young family across Wisconsin and Illinois inspired him to change careers and start a new kind of restoration business. 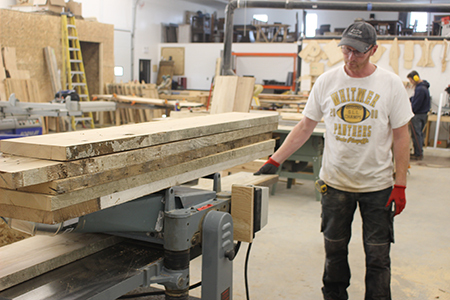 “It was August 2008 that I came up with the idea of Prairie Barnwood,” says Wyton, referring to his current company based in Morden, Man. 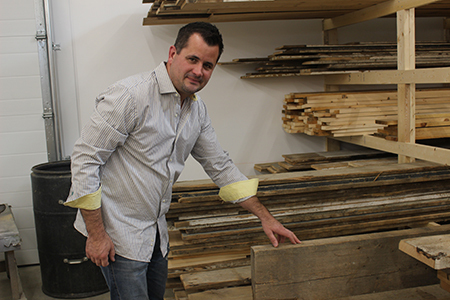 The company knocks downs disused barns, mostly in Ontario, and reclaims the wood from walls, floors and beams to produce made-to-order furniture through its showroom and website. 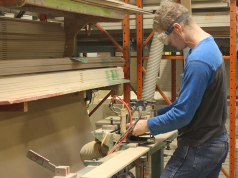 Wyton grew up in Edmonton, Alta., and worked in one of the family businesses. “My grandfather owned a few different businesses. The one that I remember working in when I was around 12 years old in the evenings and weekends was manufacturing nylon tow ropes for the oil fields. 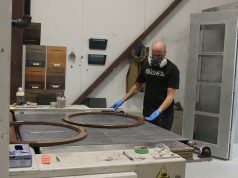 “Later, I got into refinishing antiques as well as working at the rope factory.” He also met his Manitoba-born wife in 1999 and was soon off to an auction in Winnipeg to purchases antiques for his fledgling restoration business. With the one employee at the time, the two took about a month pull down the entire barn, each day taking down a bit more. “We did it fairly crudely because we really didn’t know how to do it and didn’t know what to keep. 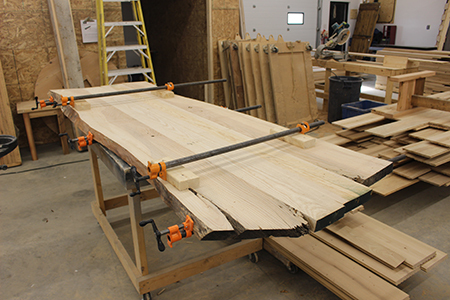 We came back to our shop here in Morden and one night I built a Mission style hall table. 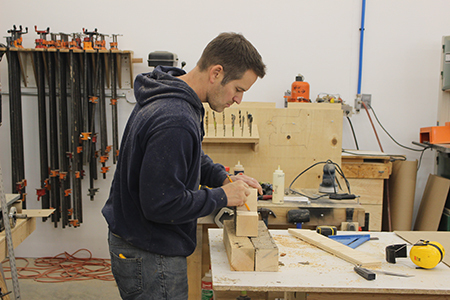 Staff at Prairie Barnwood are artisans more than they are just employees, according to Wyton. “They have to be very patient with me,” he laughs. “They also have to be very patient with the wood. Sometimes you have to pick through a lot of wood to find the right board to build a table out of. It takes somebody with a certain art form to build these pieces, including sanding them. “When you are sanding you are looking at the board and you are looking to highlight and bring out the different features of the wood. It’s not like sanding a new kitchen cabinet where you make it smooth and send it off to finishing. You are trying to look at the textures of the wood and the knot holes. Kind of create a story as you are sanding it. Although each piece is built specifically for the customer and is primarily sold online, the company’s business model harkens back to the catalog shopping practices of a century ago. “Timothy Eaton’s (a Canadian department store chain) in the early 1900s would send salespeople out door to door and they had the Eaton’s catalogue. They would sell barns, schools, community centres and houses. There were also all kinds of furniture in the catalogue. It’s funny how I have kind of modeled that in Prairie Barnwood — because each piece is built for you, what I find is best is if we come right to your home. We sit down at your kitchen table and we bring samples and pictures. Typical customers look on the website, call into the office and make an appointment. “I have flown to Calgary to meet with customers in their homes,” says Wyton. “I will fly there for the day and set up three or four appointments and go and meet people in their homes.” The company has even flown a representative to Churchill, Man., to outfit tundra buggies that go out onto the ice for tourists to look at the polar bears. 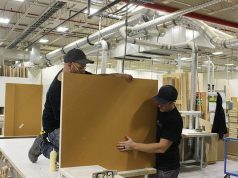 “It’s more a one on one relationship trying to understand what you as the customer want,” says Wyton, “then we are able to create it.